Even as millions of earthquake victims are languishing in tarpaulin tents and temporary shelters in the harsh winter weather, waiting for government’s promised grants to rebuild their destroyed houses, there are reports of NGOs and INGOs blatantly misusing funds meant for the victims. One of the largest humanitarian organizations of the country, Nepal Red Cross Society (NRCS), was found to have squandered more than seven million rupees for a lavish staff meet in Chitwan. This was the money meant for quake victims. The same organization has spent Rs 245 million donated by various organizations on salaries and allowances for its officials, on foreign trips and sophisticated office and purchase of items like cars, motorbikes, scooters, computers and pen drives. For a total of Rs 2.19 billion that NRCS has spent in the past 19 months, it has only constructed 118 houses, four health posts, one hospital and 280 latrines. This proves that a huge amount of money that was to be spent on earthquake victims has actually been spent on staff salaries and honorariums. Thanks to Republica for reporting this egregious misuse of donor money, both Social Welfare Council (SWC) and the National Reconstruction Authority (NRA) have woken up from their slumber and have started investigating and monitoring the activities of NGOs and INGOs involved in reconstruction and rehabilitation. Even though more than 400 humanitarian agencies contributed to post-quake relief and recovery and 145 I/NGOs are still mobilizing as much as Rs. 40.74 billion in overall reconstruction and rehabilitation, the plight of quake victims remains unchanged. I/NGOs might prepare excellent success stories but most people haven’t experienced any improvement in their lifestyle. This means there is something wrong with I/NGO modus operandi. That said, not all organizations are rotten eggs. Some have made marked difference in the lives of people in rural Nepal. They have provided the poor and marginalized with basic services like health, drinking water and sanitation and imparted various skills training. Social workers like Anuradha Koirala, Puspha Basnet and Dil Shova Shrestha have inspired people both in and outside the country for their great service to the society. But for the rotten eggs of the sector, social service is a big business, nothing more. I/NGOs have been working in Nepal for the past 50 years to improve people’s livelihoods. The number of I/NGOs, earlier restricted and even banned by Panchayat government, increased drastically after the political change of 1990. Today there are 38,000 NGOs and 178 INGOs registered with the Social Welfare Council (SWC). Of them 6,089 are affiliated with NGO Federation of Nepal, an umbrella body of NGOs. This is the highest I/NGO density in South Asia. There is a growing trend in Nepal of registering NGOs purely for profit motive. INGOs are considered dollar farming industries. Instead of working together with the government these organizations run parallel governments. 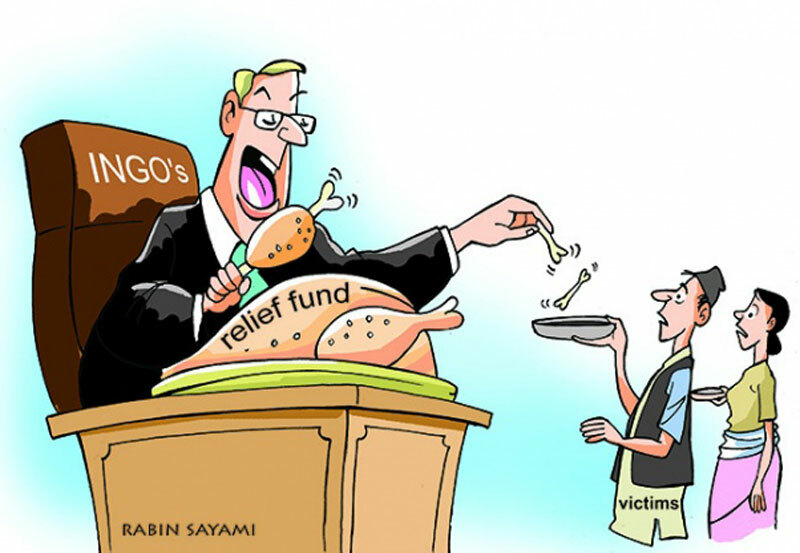 Some NGO activists and aid agencies have done more harm than good. Others compete against each other for funding, without any care about possible duplication of work. I/NGOs need to take the approval of the District Development Committee (DDC) to implement their programs. But ministries sign memorandum of understanding (MoU) directly with I/NGOs, undermining the role of DDCs. No organization can spend money in Nepal without the clearance of the Social Welfare Council (SWC) but most I/NGOs defy such rules. This is a root cause of many anomalies in I/NGO sector. This is why the government should strictly enforce the Social Welfare Act to monitor and regulate I/NGOs. Government should also strongly implement one door policy to check their haphazard working. SWC should be given the authority to abrogate the registration of I/NGOs misusing funds. At the moment, it can only recommend dissolution of such I/NGOs. SWC should also work as a bridge between these organizations and government line agencies. In a country where MPs skip parliament meetings to attend I/NGO workshops as they get greedy about the honorarium, it is futile to expect them to bring laws to check I/NGO excess. Many MPs and politicians even run their own I/NGOs. This is why there is utter chaos in the sector. However, the media, the government and the general public should not stop advocating for greater regulation and monitoring of I/NGOs in Nepal. The mess in them needs to be cleaned up.